Entrepreneur & Founder of Coffee Republic. Author of Switched On. Sahar Hashemi is one of UK's most inspirational female entrepreneurs and a powerful speaker on innovation and entrepreneurial mindset. 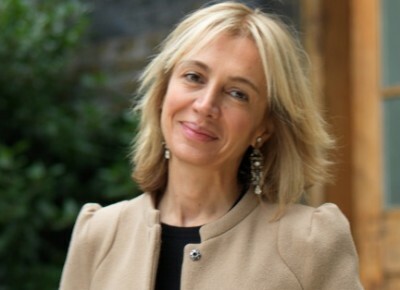 Sahar Hashemi is a former lawyer and the founder of Coffee Republic, the UK’s first US style coffee bar chain. She built it into one of the UK’s most recognized high street brands with a turnover of $30 million, making it one of the first players in the “coffee revolution” that transformed the UK high street. Hashemi left the day to day management of Coffee Republic in 2001 and published a bestselling book called Anyone Can Do It- Building Coffee Republic from Our Kitchen Table, which has been translated into 6 languages and is 2nd highest selling book on entrepreneurship on Amazon after Richard Branson’s book. In 2005, Sahar Hashemi started Skinny Candy, high profile brand of guilt-free sweets which she sold to confectionery conglomerate Glisten plc in 2007. Her latest book Switched On: 10 Habits to Being Highly Effective in Your Job, and Loving It focuses on creating an entrepreneurial mindset for employees in large companies. In 2014, she will publish her next book The Passionate Business. In 2011, Hashemi was nominated by Director magazine as one of the Top 10 Original Thinkers, taking her place alongside individuals such as Sir Tim Berners-Lee, the inventor of the World Wide Web and Jonathan Ives, Vice-President of Design at Apple and designer of the iPod. She was also invited to join the Entrepreneurs Forum set up by UK Business Minister Vince Cable to give advice to the government on enterprise and business policies. In June 2012, Hashemi was awarded an OBE in the Queen’s Birthday Honours list “for services to the UK economy and to charity.” She was named one of 100 most influential women in Britain by the Daily Mail. Hashemi writes a regular management column for Business Strategy Review, published by the London Business School. She is a member of the Customer Council of E.On, the energy group, representing the voice of the customer at board level. An internationally recognized speaker, Hashemi’s captivating and uplifting speeches combine her own enthralling story with key themes of entrepreneurial leadership, innovation, customer service, change management and employee engagement. By telling her very personal journey, she connects with the audience on an emotional level and brings to life the passion, determination and open mindedness needed to succeed.